C# is normally said to have a Unified Type System, that is–every type derives from object (System.Object), directly or indirectly. This is mostly true, but not completely accurate. Most types do derive from object, including: classes, value types, and delegates. And all object instances that you work with will be instances of types that do derive from object. (Or they will have a null value). interface – an interface is a type that does not derive from object. Rather, an interface can be implemented by some type that does derive from object. C# has a unified type system, which means that all types inherit, directly or indirectly, from object (System.Object). This includes both reference and value types. It also includes all primitive types, like int and bool, as well as every type provided in the .NET Framework and every custom type that you define. Because every type inherits from object, you can call any of the System.Object methods (e.g. Equals and ToString) on an instance of any type. An object will potentially be deleted after there are no longer any references to the object. You reference an object using a reference-typed variable. There are several different ways in which a reference to an object can be released. You create an object, or an instance of a class, using the new keyword. 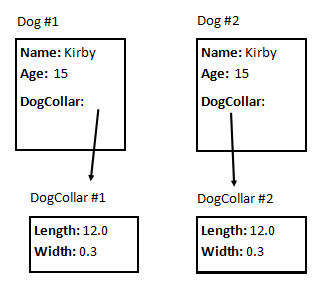 When you create the object, you must also refer to it using a reference-typed variable. Using the new keyword, you explicitly create objects. A;though you create objects explicitly, you never explicitly delete them. Instead, an object can be deleted after it is no longer being referenced by any reference-typed variables. Once the object has been deleted, the CLR (Common Language Runtime) will reclaim the memory that was being used by the object. Not only do you not explicitly delete objects, you also can’t predict when the object will be deleted. The CLR will decide when to delete the object, based on when it needs the memory that the object is using. Every type inherits from System.Object, directly or indirectly, and therefore has access to its members. Here’s a brief summary of all members of System.Object.